Australia were denied a certain victory in the third match of the DLF Cup, as the wet weather played havoc for the second match in a row at the Kinrara Oval. After Australia mustered 244, India, set a revised target of 170 in 29 overs, were decimated by an outstanding spell of fast bowling by Mitchell Johnson, who ripped out the heart of the Indian batting in two hostile overs. He returned magnificent figures of 4 for 11 to have the Indians reeling at 35 for 5 in eight overs, before the rains returned to save India the blushes. The MASTER is back with a bang but India loose the match beacuse of the lousy Duckworth-Lewis method that came into play after the much talked weather showed its colors. No matter what the venue, an anticipatory buzz accompanies Sachin Tendulkar’s every walk to the middle. And even though only a few hundred turned up at the Kinrara Oval on a gloomy afternoon, there was no mistaking the eagerness with which they settled into their seats once it was known that India would bat. Sachin Tendulkar dismissed any doubts of form and fitness as he registered his 40th One-Day International hundred against the West Indies, in the second match of the DLF Cup tri-series in Kuala Lumpur on Thursday. But his comeback hundred was overshadowed by the result: a 29-run victory for the West Indies courtesy the Duckworth-Lewis method. Electing to bat, India scored 309 for 5. In reply, the West Indies raced to 141 for 2 before rain stopped play. When the D/L calculation was made, the West Indies needed 112 for the loss of two wickets in 20 overs. The 33-year-old Tendulkar, playing his first ODI since February, hammered five sixes and 13 fours to score an unbeaten 142 from 148 balls. He was well-supported by Rahul Dravid (26), Irfan Pathan (65) and Suresh Raina (34). The West Indies had lost the first match of the tournament, going down by 72 runs to Australia on Tuesday. For those of you who don’t have access to Dish Network (US) and ATN CBN (Canada) and are big fans of cricket, you can watch the matches on your computer through Willow TV site. They have various packages with the Highlights package as cheap as $13. You check them out. DISH Network and Willow TV present live video streaming and Highlights of the Tri Nation series to be played in Malaysia, and the ICC Champions Trophy 2006. Watch the best cricket action this season for a single price! Interactive Video Highlights of all events in brought to you in association with Cricinfo. 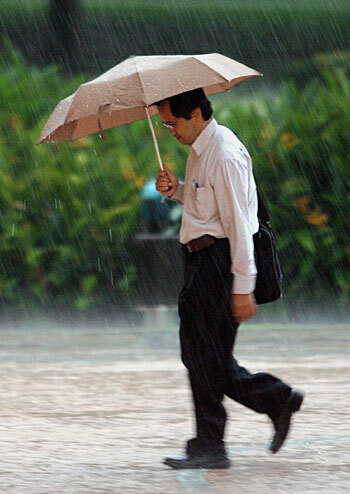 Malaysia Tri Nation’s Cricket Series – It’s going to be Weather again……..
A man returns home after office hours during heavy rain in downtown Kuala Lumpur. India’s board admitted there have been heavy downpours in the evening over the last few weeks, September 11, 2006. 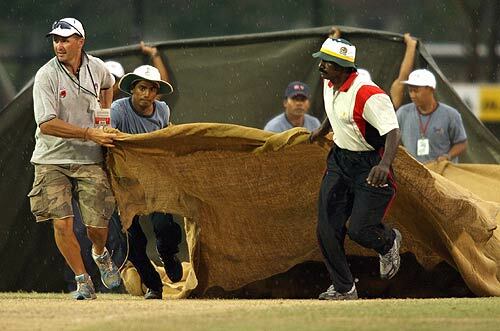 It looks like another Sri Lanka kind of series where the whole series might be washed out. Don’t understand why don’t cricket boards check weather conditions before organizing these events. The ICC Champion’s Trophy, featuring the greatest players in cricket, face off in the most intense competition available before the World Cup. Will the West Indies defend their title? Will Australia continue its’ run? Will the embattled Pakistani side show its mettle and silence its’ critics? Alright people, those of you who have been waiting to find out where who is showing the next few cricket series (Malaysia Tri Series, ICC champions trophy) in North America, here is the breakdown. For US, Dishnetwork will be showing the matches on Pay-per-view. Phase 1 of the ticketing programme for the 2007 Cricket World Cup to be help in West Indies has finished and the people who applied for these tickets have been sent an email telling them the status of their application. I was successfuly allocated 4 seats for two matches that we are planning to go and attend. For those of you, who wish to travel to see the matches and haven’t bought the tickets yet, you can check out the Offical Cricket World Cup 2007 Site to apply for the remaining tickets.